On Monday September 19 2016, Minister of Higher Education and Training Blade Nzimande announced that university councils had to determine their own fee increases for 2017, however the increase should not be above 8%. Students did not take well to his announcement. They felt that he did not address the real issue of free, decolonised education so they retaliated in protest. The following weeks became characterised by standoffs between students and police. There were multiple arrests made and a sense of confusion between various groups of people. The protests have since ended. The majority of the deployed police officers have been removed from university campuses and things seem somewhat back to normal at most institutions. 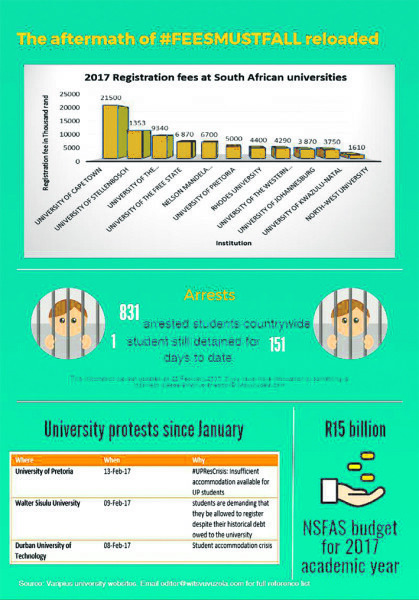 The infographic highlights a few issues that have fallen under the #FeesMustFall 2016 banner. What has happened since? How much are students paying now? What’s the update on the arrested students?